Deciding which hotel to book might be difficult and confusing, as there are over 100 hotel options in Geneva. On clickable map of Geneva Hotels provided by our partner booking.com, you can covneniently see the location, name and price per night of any hotel in Geneva. Most of the hotels are in the city center - Paquis and Old Town and there are about dozens of hotels at the Airport. 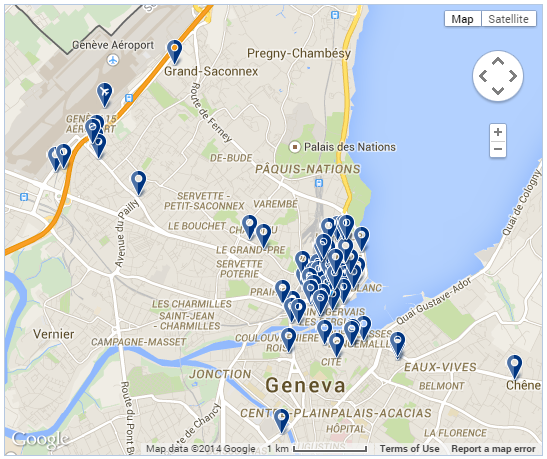 Have a look on the Map of Hotels in Geneva at our parther's website Booking.com to choose the hotel that suits You best by it's location and it's price. See also other maps of Geneva.